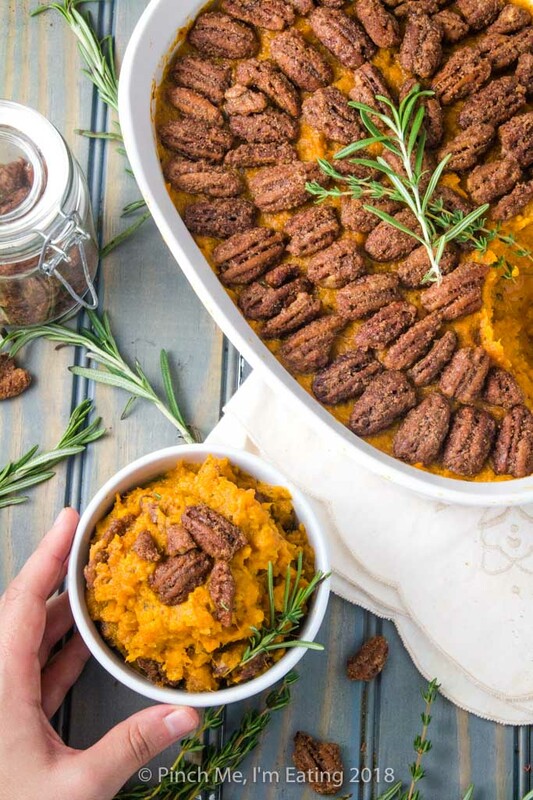 Rosemary Sweet Potato Casserole with Pecans | Pinch me, I'm eating! 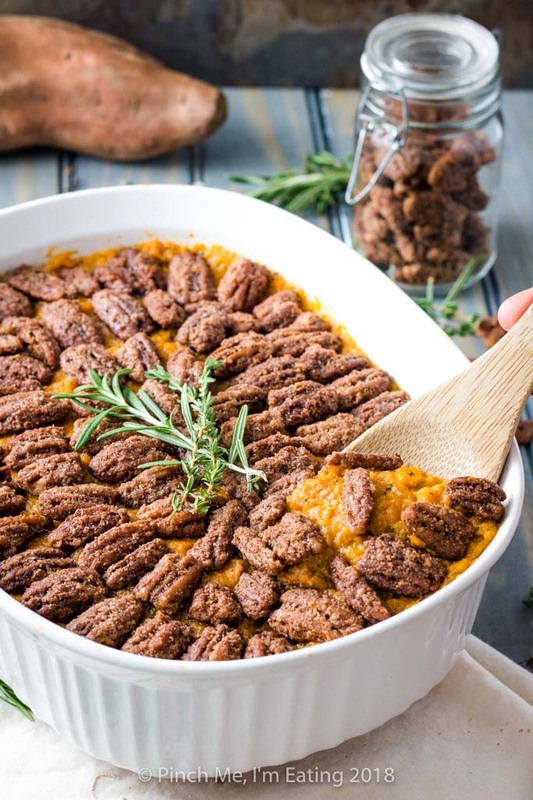 This rosemary sweet potato casserole with pecans candied in cinnamon sugar is an easy side dish for Thanksgiving or Christmas, or you can halve the recipe for a weeknight side. The best part is you can make it ahead and reheat in the oven! In my experience, people tend to have strong opinions on the proper preparation of sweet potatoes. There are those who recoil at the thought of loading up a naturally sweet vegetable with even MORE sugar, or heaven forbid, marshmallows — and those who wouldn’t have them any other way. My stepmom and her sister are prime examples of each of these. My aunt prefers hers sweetened and topped with marshmallows, while my stepmom makes a savory herbed sweet potato casserole with pecans on top. 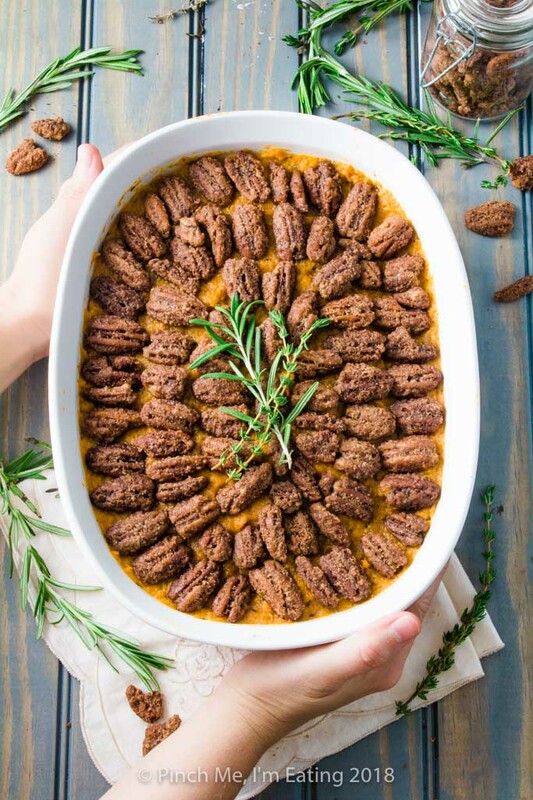 The two of them couldn’t decide who would bring their version of sweet potato casserole to Thanksgiving — so they both did. Who’s the real winner in this situation? Me! 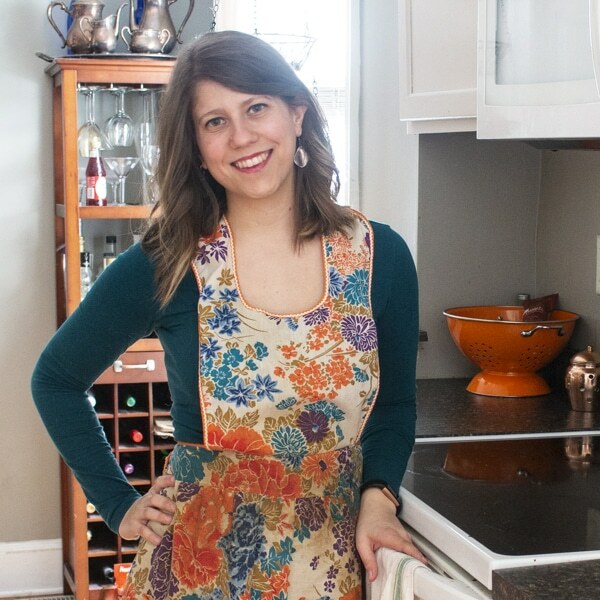 I absolutely loved having a heaping serving of BOTH sweet potato casseroles! The versatility of sweet potatoes is, to me, their greatest attribute. I am equally happy loading one up with buffalo chicken and blue cheese dressing as I am adding brown sugar and marshmallows, in what is only through convention called a Thanksgiving “side dish” and not a dessert. 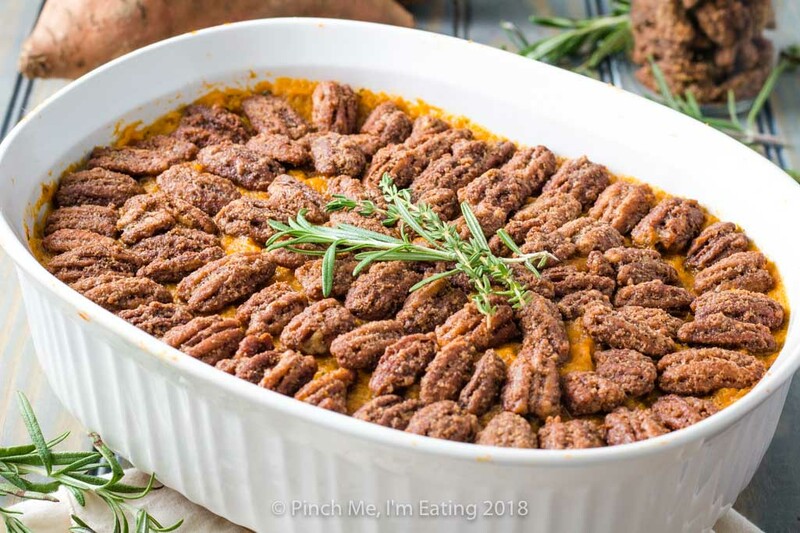 This sweet potato casserole with pecans is loosely based on my stepmom’s savory version. However, since I do love a bit of sweet and savory together, I added sugared pecans to the top instead of roasted ones. She tells me this is not *technically* a casserole and is really just mashed sweet potatoes. But served in an elegant casserole dish, it’s good enough for me! 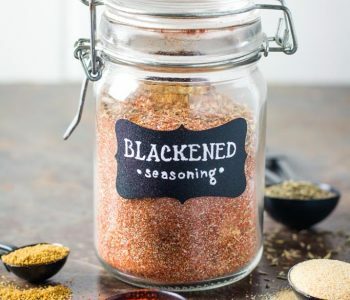 While I’ve written this recipe for the holidays to fill up a casserole dish, it’s equally delicious as a weeknight side dish, especially since it doesn’t actually require baking! 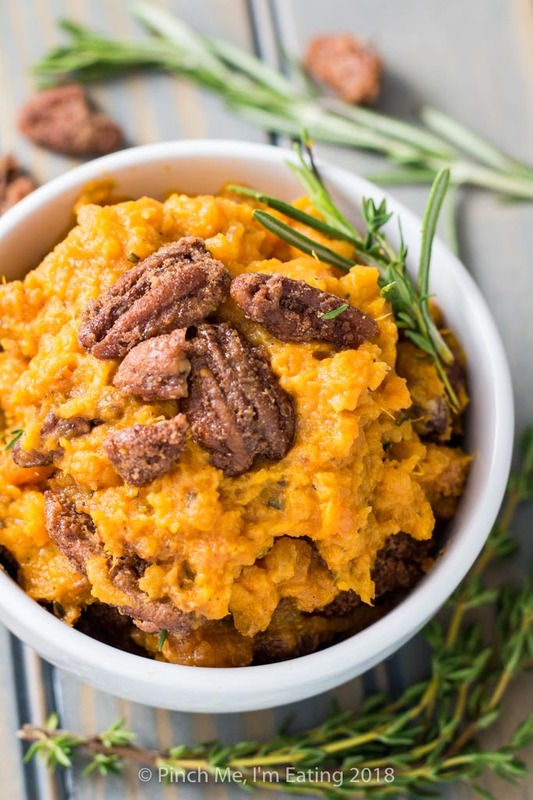 Just cut the recipe in half and serve it as mashed sweet potatoes with a pecan topping. 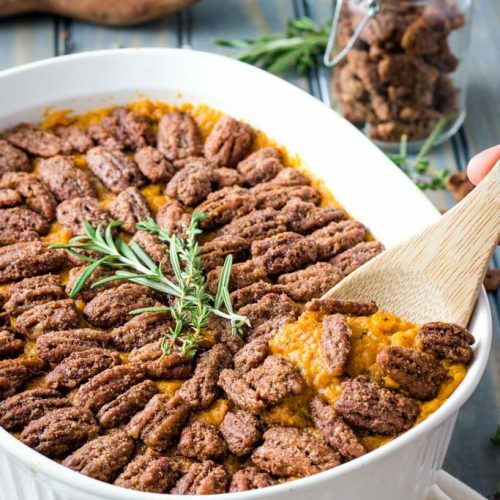 I believe if you mix a couple raw eggs in with the mashed sweet potatoes and then bake it, the texture would be a bit firmer and you could call it a real, genuine casserole. I haven’t tested this way yet but I will update the post when I do! With plenty of thyme and rosemary mixed in, the mashed sweet potatoes themselves are earthy and aromatic, with a bit of browned butter added for a nutty richness. 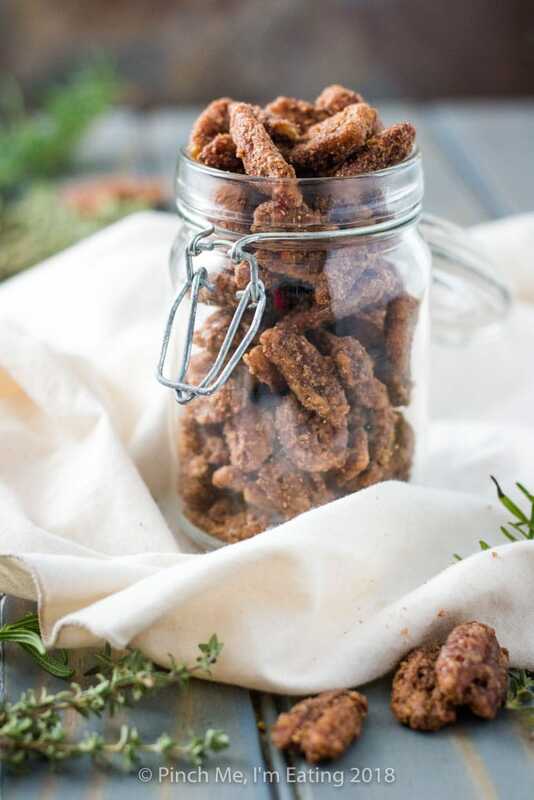 Topped with cinnamon sugar candied pecans, each bite is the perfect balance of sweet and savory. Candying pecans may seem intimidating, but it really couldn’t be easier! It takes about five minutes to whisk together your sugar, spices and egg white. Be sure to get the egg white nice and frothy! That’s what gives the pecans their characteristic crunchy textured coating. Then you just mix in the pecans and pop them in the oven for a while, stirring every few minutes so they get evenly crisped. I used the candied pecan recipe from Self Proclaimed Foodie, which is delicious and full of buttery goodness. 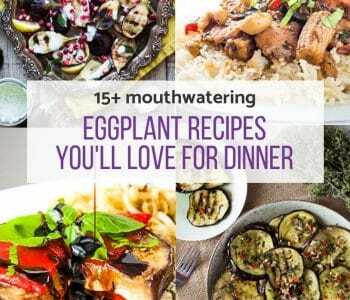 So maybe Thanksgiving or Christmas is coming up and you’re planning 16 other dishes to make as well. 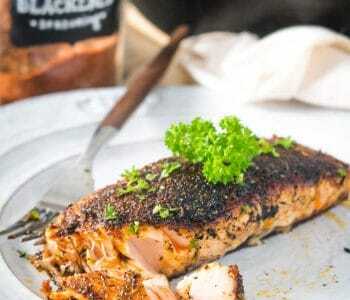 How can you save on time and sanity while not compromising the final dish? 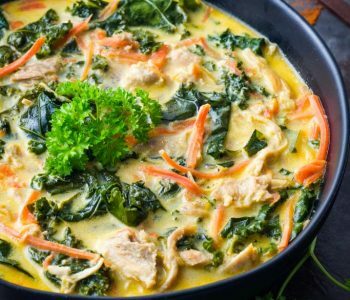 While this dish isn’t difficult, there are a few shortcuts you can take to shave a few steps off your holiday dinner preparations. Buy candied pecans instead of making them. They can be a bit pricey and it is very simple to make them yourself (even in advance) but I know the holidays are crazy and sometimes you just want to save a little time and effort! 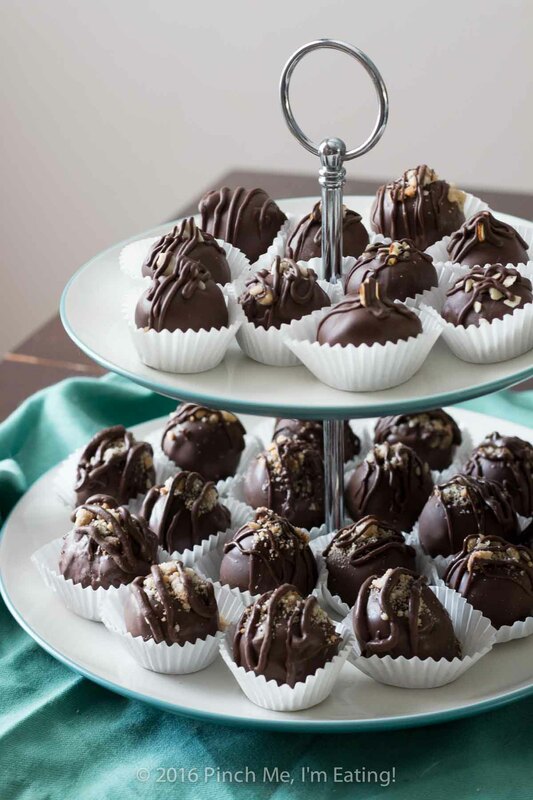 Alternately, candy your own pecans far in advance. Store them in an airtight container for a week or two and they’ll still be perfectly fine for topping your casserole! Skip browning the butter. You won’t get that added toasty nuttiness, but it will still taste great! Plus, that’s one less pan to wash.
Buy pre-diced sweet potatoes — if these are available where you shop. 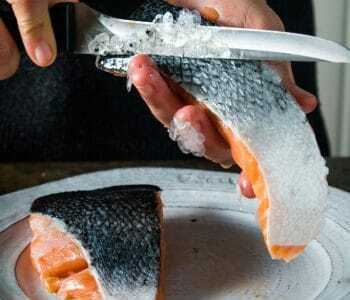 Again, it’s your call whether the added cost is worth the time saved peeling and chopping them yourself! Use dried herbs. I’d personally advise against this shortcut because I think fresh herbs add so much to the dish. But I do know thyme especially can be a beast to get enough leaves off the fragile stems, and you may want to avoid fingers covered in rosemary sap. 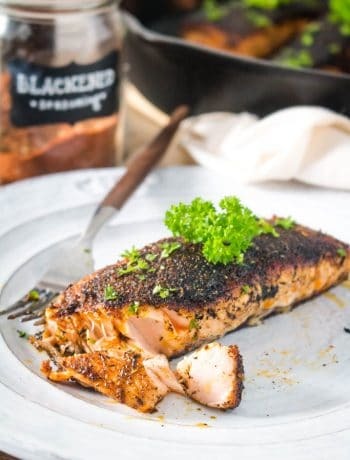 If you use dried herbs, substitute 1 tsp dried herbs for each 1 tbsp of fresh herbs. Make the whole sweet potato casserole a couple days in advance. 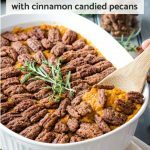 Reheat the casserole dish in the oven, and don’t add the candied pecans to the top until just before baking or they will soften. I love this sweet potato casserole! 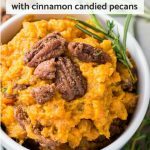 It has a savory base of mashed sweet potatoes with plenty of rosemary and a hint of brown sugar, and is topped with pecans candied in cinnamon sugar. It’s an easy side dish for Thanksgiving or Christmas, or you can halve the recipe for a weeknight. The best part is you can make it ahead and reheat in the oven! Note: Since this does not require baking, it is not technically a casserole. But that just saves you space in the oven, and it's just as pretty and delicious! Preheat oven to 350 degrees. Line a 9x9 or larger baking sheet with parchment paper and pour melted butter on top. In a bowl large enough to hold and stir all the pecans, whisk together egg white, sugars, vanilla extract, and cinnamon until frothy. 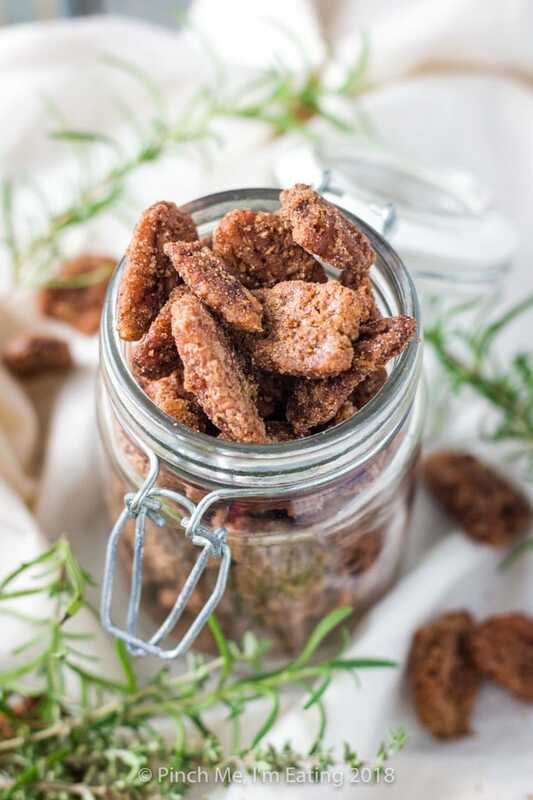 The frothier it is, the more textured and crispy your candied pecans will be! Stir in pecans until coated thoroughly. Spread out pecans in a single layer on baking sheet. Bake for 20-30 minutes, stirring every 5 minutes or so to ensure they don't burn and all the surfaces are evenly baked. Remove from oven and stir a couple more times as they cool so they don't stick together. Store in an airtight container. Put sweet potato cubes in a large pot and cover with water. Bring to a boil, then reduce heat to medium and simmer for 15 minutes or until potatoes pierce easily with a fork. Drain well. While potatoes are cooking, melt butter in a small saucepan on the stove over medium heat, stirring constantly so it doesn't burn. The butter will foam up, and then the foam will subside over a few minutes. When you see the butter turn a golden brown color and it starts to smell nutty, remove from heat. Be sure not to burn it! Mash potatoes with browned butter and herbs. Then mix in 1/4 cup of milk and add more slowly until the potatoes reach your desired texture. Depending on how much water the potatoes hold and how thick you like them, it may be between 1/4 to about 3/4 cup of milk. Spread potatoes evenly in a 2 1/2 quart casserole dish or 9x9 inch baking pan, and arrange candied pecans on top. 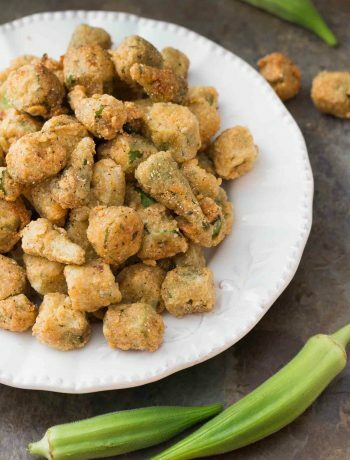 Serve with remaining pecans on the side for people to add to their potatoes! Make the pecans in advance and store at room temperature in an airtight container or ziplock bag. 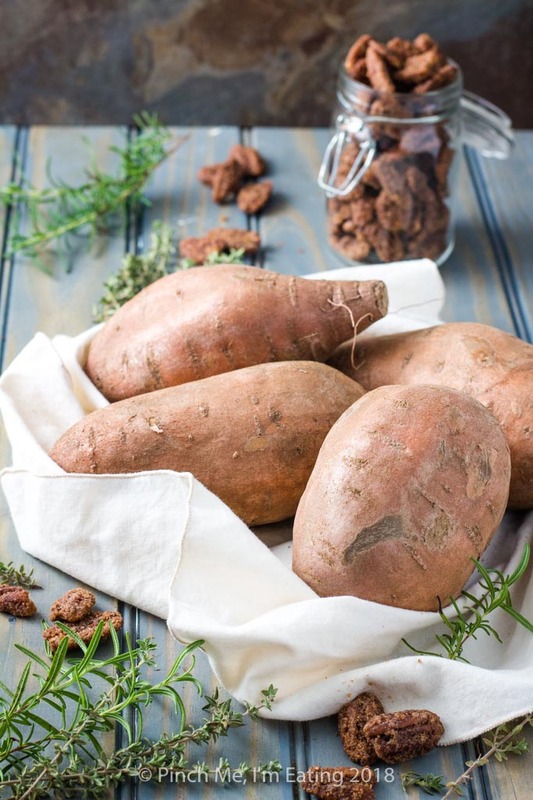 You can also make the sweet potato mixture in advance and refrigerate for a couple days. If making ahead, leave the pecans off until just before serving. To reheat, preheat oven to 350 degrees, top casserole with pecans, and bake for 30 minutes. Be cautious of ceramic or glass casserole dishes, as they may not like going straight from the fridge to the oven and may crack. Bring these to room temperature first!